Lurch: Paul Rhoads (Iowa State) – I’m not sure if this guy is tall or quiet or anything, but when thinking about his team, Iowa State is lurching up in the Big 12 North. No one believed a first year coach could come in and make Iowa State competitive but it’s happening. I promise you they’ll lurch their way into a bowl game this year, too. Morticia: Mack Brown (Texas) – Morticia was the matriarch of the Addams Family and in a way, Mack Brown is for the Texas Longhorns. Year in and year out, the look over the Big 12 and usually take care of things in the bowl games. Just don’t picture him in a dress. Grandmama: Bill Snyder (Kansas State) – Okay Grandmama is really old and so is Bill Snyder. Like 70 years old. Bill’s seen it all and is ready for all. 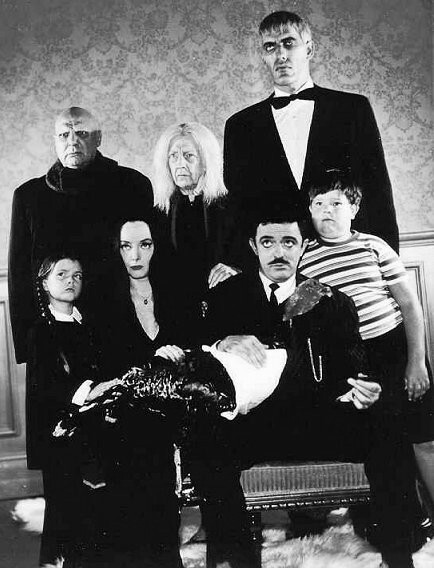 Much like Grandmama is for the Addams Family. Watch out for these two, they still have a trick or two left. Thing: Dan Hawkins (Colorado) – So in the series, Thing is really just a hand. So when we think of Big 12 coaches handing games away, it’s Dan Hawkins. How does he do it? By handing the ball of to his quarterback son, Cody. The Buffaloes would be way more competitive if they had the more talented Tyler Hansen was playing. Cousin Itt: Mike Gundy (Oklahoma State) – A hairy fellow who’s unintelligible when talking and going off on rants. These two match up perfectly. Although we don’t think Mike Gundy goes through too many razor blades. Wednesday: Gary Pinkel (Missouri) – So Wednesday started out quiet but as the series went on, she got louder and louder. Pinkel’s alot like that. He was fairly held together for years until he started complaining about blown calls and such. Put him in a dress. Pugsley: Bo Pelini (Nebraska) – When we think of a happy go lucky slob, we think of Bo Pelini. Pugsley goes around getting into damage and not really caring. Some say he enjoys it. So when Nebraska chokes up 8 turnovers on their home field, we think the only reason it could happen is because Pelini likes it. Uncle Fester: Mark Mangino (Kansas) – Come on. This was way too easy. Big, fat, and goofy pretty much matches up with the coach. It’s the whole reason we wrote this. It’s better to picture Mangino in a black frock than next to the Orange Bowl Mascot. Gomez Addams: Mike Leech (Texas Tech) – The truly creepy and cooky guy on this list is Mike Leech. The love for oddball things that Gomez takes part in reminds us of the oddball things Mike Leech does for real. Although we can picture Leech crashing pirate ships together instead of model trains. Now, you’re wondering, what about the rest of the coaches? Meh, there’s not enough family members to go around. Besides, we need to run off and get ready for Halloween. Have fun watching the games tonight and try not to get too bothered by the trick or treaters. Happy Halloween!